At the time this photo was taken, Mercury was at inferior conjunction. An inner planet has an inferior conjunction when it passes between the sun and Earth. At intervals of about 13 or 14 times a century, we get to see Mercury cross in front of the sun at inferior conjunction. Transits do not occur with every inferior conjunction because the orbits of the inner planets and Earth's orbit are not perfectly aligned. Transits of Mercury only occur in November or May, when the planet is crossing one of the two nodes in its orbit. In addition, a transit can only be observed from a particular location if the event occurs during daylight hours while the sun is visible. The two transits prior to this one were not visible from North America because they occurred after the sun had set. This photo shows the grazing transit of Mercury on November 15, 1999. Because of the huge size of the sun, and the smallness and distance of the planet, Mercury is nothing more than a small round black speck on the face of the sun. This was called a grazing transit, because the planet's path moved across the northeastern limb of the sun, just hemming the sun's edge. 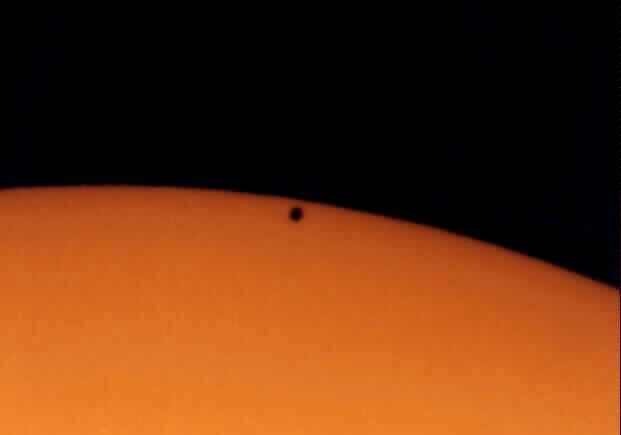 The transit of Mercury on May 7, 2003, was visible from Europe, Africa and the Middle East. If you missed that transit, you have another chance to see Mercury transist the sun on November 8, 2006. Mercury is an inferior planet, meaning it's orbit lies inside our orbit. The inferior planets show phases, i.e., changes in their apparent shapes, like the moon as they move about the sun. At inferior conjunction, the phase of Mercury is similar to the "new moon" phase of the moon. Venus is also an inferior planet and shows phases. Mercury has almost no atmosphere. It's surface is heavily cratered by meteorite impacts and resembles the surface of our moon. Mercury's diameter is 4,878 kilometers at the equator, as compared to the Earth's 12,756 kilometer diameter. The surface gravity on Mercury is 0.28 times the Earth's gravity. A person who weighed 100 pounds on the Earth would only weigh 28 pounds on Mercury. Jupiter and Saturn each have a moon that is larger than Mercury. A "year" on Mercury is only about 88 Earth days. Mercury orbits slowly, completing a rotation on its axis only one and a half times for each revolution it makes around the sun. Thus, a day on Mercury is equivalent in duration to about 59 Earth days. Mercury's orbit is quite eccentric. As a result, the speed of the planet in its orbit varies considerably. The variation in orbital speed would produce some interesting effects if you were on the surface of the planet. In some locations on Mercury's surface, the sun would rise in the east, then stop, back up, and set in the east. The sun would then rise again in the east, move across the sky to the west, set, rise again in the west, then finally set again in the west. This photo was taken with a Takahashi FS-128 refractor using eyepiece projection (12mm occular). The film was Kodak Gold 100 film. A solar filter was used over the front of the telescope. RA: 15h 23m 9.8s Dec: -18d 17' 52"